Finals are just around the corner, and students all over this university are beginning to prepare: making study guides, going to office hours and hunkering down for the weeks ahead. For observant Jewish students, this time may be difficult. Many observant Jewish students at this university keep Shabbat, the Jewish day of rest. Strict observance often means that Saturdays are spent attending evening and morning services, as well as refraining from technology and engaging in other work. As a result, they lose critical study time to work from Friday afternoon until Saturday night each week. Spending time away from technology may also put students who use laptops and the internet to study at a disadvantage. 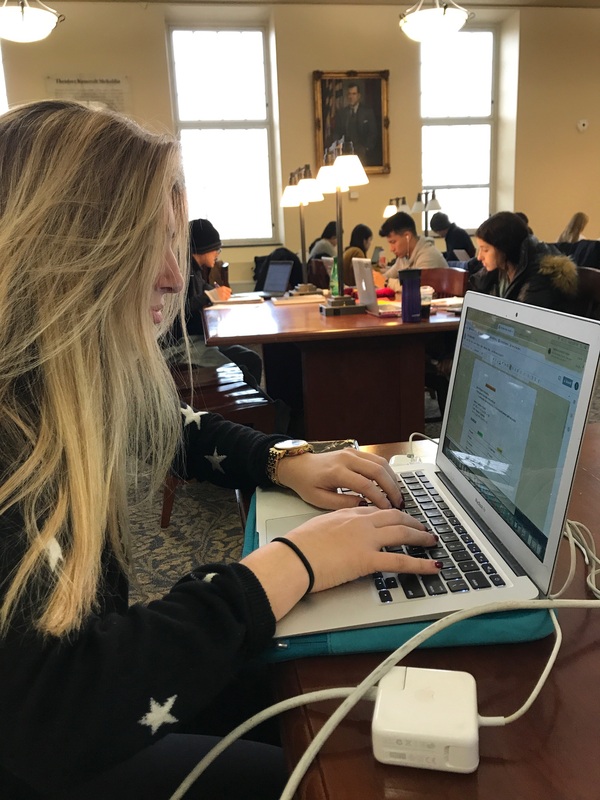 Sara Edelman stays on top of her work and types up her class notes in the library. Hallie Kay/Mitzpeh. Issues can also arise when exams are scheduled on Saturdays, which pose difficulties for students who refrain from writing on Shabbat in their observance. The university has created a policy to accommodate these students. Students can also fill out a “Holiday Exemption Letter Request,” which grants them an excused absence for other religious-related absences. It can be found in the section entitled “Holidays” on the UMD Hillel website. “In my experience, professors have been really understanding. Some don’t even require the note, they just tell you to email them a reminder and they’re always super willing to come up with a workable solution,” Pickholz said. Some observant Jews see the day of rest not as a loss, but a blessing. Sometimes, it is merely a matter of staying on top of work and making sure it all gets done before Shabbat begins on Friday nights. Many students will finish their work even earlier to prepare an evening meal and set up for Shabbat. “Obviously it comes with its challenges, but I just know that I have to prepare beforehand, whether that is printing out my notes or filling out a study guide before,” Sinai said. For many observant students, the struggle to keep Shabbat during finals is worth it to preserve the strong ties and communities that they have at home. No Replies to "Observant Jewish students struggle as finals week approaches"